Careful research by professional analysts using such ancient manuscripts as the Domesday Book (compiled in 1086 by William the Conqueror), the Ragman Rolls, the Wace poem, the Honour Roll of the Battei Abbey, The Curia Regis, Pipe Rolls, the Falaise Roll, tax records, baptismals, family genealogies, and local parish and church records shows the first record of the name Grice was found in Norfolk where conjecturally they were, in 1066, Lords of the Manor of Brockdish, the King’s land, whose feudal Lord was William de Noyers, Count of Nevers seated originally at Poitevin and St-Cyr de Nevers in Normady. Sir William also held Grayhurst Manor through Bishop Odo from King William of Normandy. From this family also descend the Lords Monson and Viscounts Castlemaine. The original estates were sold in 1327. The village now consists of a church, St. Edmunds, which has both Saxon and Norman windows, obviously predating the Norman Conquest by many years. Many alternate spellings of the name were found. They were typically linked to a common root, usually one of the Norman nobles at the Battle of Hastings. The name Grice occurred in many references, and from time to time, the surname included the spellings of Grice, Gryce, Grise, Grisewood, DeGrice, Grycie, and Griese, and many more. Scribes recorded and spelled the name as it sounded. It was not unlikely that a person would be born with one spelling, married with another, and buried with a headstone which showed another. All three spellings related to the same person. Sometimes preferences for different spelling variations either came from a division of the family, or, for religious reasons, or sometimes patriotic reasons. 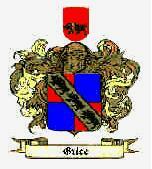 The family surname Grice is believed to be descended originally from the Norman race. They were commonly believed to be of French origin but were,, more accurately, of Viking origin. The Vikings landed in the Orkneys and Northern Scotland about the year 870 AD, under their Chief, Stirgud the Stout. Later, under their Jarl, Thorfinn Rollo they invaded France about 940 AD The French King, Charles the Simple, became the first Duke of Normandy, the territory of the north men. Duke William who invaded and defeated England in 1066, was descended from the first Duke Rollo of Normandy. Duke William took a census of most of England in 1068, and recorded it in the Domesday Book. A family name capable of being traced back to this document, or to Hastings, was a signal of honour for most families during the middle ages, and even to this day. In the process of researching this distinguished family name the most ancient grant of Coat of Arms was traced from the branches which developed their own Arms. The most ancient grant of a Coat of Arms found was: Red and blue quartered background, on a silver sash, three black boars, tusked. The crest is a wild boar with a gold crown. The surname Grice emerged as a notable English family name in the country of Norfolk where the original estates and village evolved from Bodise, then Brodiso, then Brockdish, and later Brokedish, and was, at one time, even mispelt Brokedisk. Grice has been incorrectly related affectionately to a small pig by some historians, but more properly it is translated as “the Grey”. The family also gave their name to Grisewood from an ancient estate. By the 13th century at least one branch of the family had been lured north by Earl David of Huntingdon’s (King David of Scotland) promise to the Norman nobles of lands in Scotland. Mungo Gryse was associated with the Abbot of Sweetheart Abbey in 1555, and later, during the religious turmoils of the 17th century, Robert Gricie of Buittle was accused of being a papist. Meanwhile, in England, the main stem of the family acquired estates in Iver in Buckinghamshire and at Littleton in Middlesex. They also branched to Essex. Notable amongst the family at this time was Grice of Brokedish. The surname Grice contributed much to local politics and in the affairs of England or Scotland. During the 12th century many of these Norman families moved north to Scotland, following Earl David of Huntingdon who would become King of Scotland. Later, in the 16th, 17th and 18th centuries England and Scotland were ravaged be religious and political conflict. The Monarchy, the Church and Parliament fought for supremacy. The unrest caused many to think of distant lands. Settlers in Ireland became known as the “Adventurers for the land in Ireland”. They “undertook” to keep the Protestant faith, and were granted lands previously owned by the Irish. Elizabeth Grice was married to Alderman Daniel Hutchinson, Lord Mayor of Dublin in 1651. Elizabeth was descended from the main branch of Brokedish. In North America, migrants which could be considered a kinsman of the family name Grice, or variable spellings of that same family name included Katherine Grice settled in Maryland in 1774 and H. Grice arrived in San Francisco in 1850. Other settlers named Gries or Griess are unrelated and are of Germanic origin. From the port of arrival many settlers joined the wagon trains westward. During the War of Independence some declared their loyalty to the Crown and moved northward into Canada and became know as the United Empire Loyalists. Meanwhile, the family name was active in the social stream. There were many notables of this name, Grice. Benning Moore Grice, Supreme Court Justice of Georgia, U.S.A. , and his father Justice Warren Grice. But if we keep digging it also means “Swine-herd” or “Pig Farmer”. This translation is similar in both Middle French, Old French and even Icelandic. The third meaning is “The Well-Nourished One” and may be a play on the name Le Gros, meaning “The Big” . The Le Grys/Le Grice family is reported by the College of Arms to be one of only eighty families in England who can trace their lineage back to 1066. I found the grice article very interesting i too am of mixed blood irish, scottish, english and aparantly french too. if you manage to trace more info on the grice anscestry i would love to know . In 2006 curators at the Shetland Museum and Archives commissioned a taxidermist to re-create a grice from the stuffed body of an immature wild boar. As no one alive had seen a grice, the accuracy of the model relied on descriptions in “published sources … investigated artefact and archaeological findings”. The model grice went on public display in spring 2007. It is nice to learn of our roots. You can say you’ve come a long way. My roots are of Celtic descent. From Madog a Celtic tribe from Whales. We always must be proud of our heritage. I guess I have some Celt blood in me too from a Scottish Celt clan on my Grandmother’s side of the family. Most of us in the world if we could trace back in time would find a multi racial mix. My children will be able to claim English, Scottish, Hungarian, German gene pool from the recent past. Wow! I just stumbled on this today. You’re blue blood indeed. Something to be proud of – the “breeding” (please pardon that word but you know I mean it in a respectful way) shows in your world views which I deeply admire. Yes I was interested in that historical snippit too Eric. Our Grice line in Australia can only be traced back to England in the early 1700s. I believe in one of the big fires that periodically swept cities in England historical records were burned. So we will have a lot of relatives we have no idea of how to link with. The Grices in Australia started out as carriage builders and later moved into manufacturing. On my Mother’s side we can trace back to 1590 AD. The Unwin clan were mostly merchant class. I will put up their history in Australia on my blog page some time. As for breeding, I equate breeding with the way people act rather than their ancestor links.